We are back at Hinckley Marina in Savannah again. From Charleston to Beaufort SC we again took the alternate route mentioned previously to bypass the Ashepoo cutoff. We took this coming up just after high tide, but coming back we took it just after low tide. There was a very sharp (320 degree) turn that I swung very wide to avoid shoaling that the chart indicated was on the inside of the turn. As I did that a shrimp boat coming the other way radioed me that the charts in that area were way off and I should really swing that corner out further, maybe even a mile or two further. This warning came seconds after we had run aground, of course. The tide was just starting to come in, so the rate of rise at that point was very slow. That would eventually help us but the associated incoming current would tend to drive us further into the shoal area. We were just coming out into the several mile wide mouth of an inlet to the Atlantic, so now and again a wave could bounce us a little. It seemed better to try bouncing away from the shoal rather than getting washed in when the current started. Working for a few minutes, that seemed like a half hour, we got the boat turned and powered off in short little steps. Fortunately the keel of Star Gazer is lower than the props, the bottom was soft mud which would not hurt the props (taken in moderation) so I think we got off with no damage to the running gear. At least it seems to work the same. The lesson? When you’re off the ICW the charts are even more out of date than normal, so if you see a shoaling area, assume it could be far worse. I do know about this area now, and will have no problem passing through it in the future, even at low tide. How could I forget? 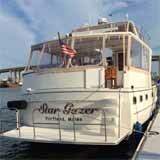 Beaufort to Savanna was just 40 miles, so we arrived back at the Hinckley docks before noon. We spent an extra day in Savannah. We toured the big synagogue, the only gothic cruciform layout synagogue in the US. They built it that way. They did not buy an old church. It’s interesting that they were the second religious congregation of any type, after the Anglican church, to form in Savannah. We walked the River street old town area on the water and ate dinner there. There is a place to dock overnight on river street which we may try next time. Savannah and Charleston are what we found to be the most enjoyable towns along our ICW trip. Of the two I think we might like Savannah the most, although it is close. 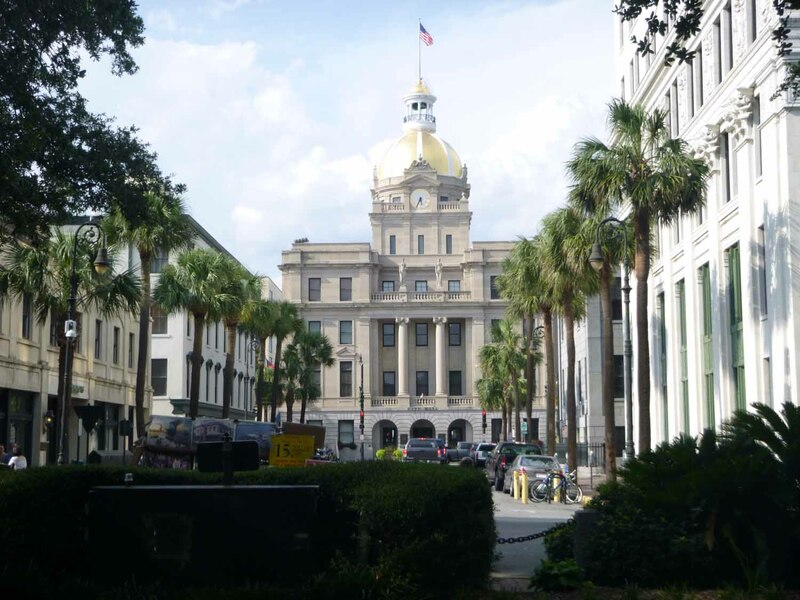 Savannah’s many town squares and River street make it a really pleasant place to be in.